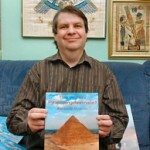 January 2009 AOM: Pyramid Mysteries? What’s that? Frank Dörnenburg was born in 1960 in Essen, Germany. After finishing high school he studied physics and astronomy and founded in 1986 with two friends a computer company which still exists today. Parallel to developing software in C++, Java snd PHP he developed an interest in ancient cultures, especially in the ancient Egyptian civilisation. In 1998 he started his acclaimed web site "Mysteries of the Past", where he examines many claims of authors like von Däniken, Sitchin and Bauval. "Pyramidengeheimnisse?" is his first book. The Egyptian pyramids are old, very old. So old that, even in antiquity, authors like Herodotus and Pliny were arguing about the riddles of the pyramids. Who built them? How? And for what purpose? Questions…questions…questions. Yet, even when the Egyptian writing system of hieroglyphics was still understood and used the pyramids were part of myth and legend. After the knowledge of hieroglyphics was lost around 500 AD, generations of Egyptophiles and pyramid enthusiasts speculated about the possible mysterious messages of the pyramids. The Arabs of the Middle Ages even saw them as messengers and treasure chambers from a lost antediluvian civilization. From the end of the 18th century on, fueled by the findings and publications of Napoleon's failed expedition, a wave of Egyptomania swept across Europe. In subsequent years, buildings in Egyptian style, obelisks and even pyramids, were erected throughout Europe. The best known German pyramids are the tombs of Fürst (Prince) Pückler and his wife, which were built around 1850. Both scholars and amateurs were trying to solve the riddles of Egypt and the hieroglyphs, but without any real success. Speculations about the pyramids grew wilder and wilder during the 19th century, and this did not change after the hieroglyphs were deciphered. But because of this rediscovery and the advent of true scientific archaeology and Egyptology, the once harmonic cooperation between the different paradigms of science, the esoteric and theosophy began to diverge up. After the father of modern Egyptology, Flinders Petrie, disproved most of the numerological pyramid theories, that rift grew larger and larger. Both sides, academic Egyptology and alternative historians drifted further and further apart. The rift is now so deep and wide that communication seems impossible. The only form of contact that takes place across it today is shouting. But why is that rift so large? Because "orthodox Egyptology" is dogmatic and sits in an ivory tower? Or because the alternative ideas are so silly that they are not worth any discussion? "Pyramidengeheimnisse?" ("Pyramid Mysteries?") tries to look at both sides and compare the differing views in an entertaining way, supported by many pictures and diagrams. To get as neutral a view as possible the book examines both sides and tries to weigh the arguments. To understand Egypt and the pyramids one needs to understand the history of the culture of the pyramid builders. Therefore "Pyramidengeheimnisse?" starts with a comparison of a typical ancient astronaut scenario and the current knowledge of anthropologists and archaeologists. During this comparison we look for evidence of postulated jumps in cultural advancement due to the arrival of ancient astronauts or teachers from a so called high civilization on Earth. We also take a close look at the Egyptian calendar, which is the only solar calendar of early antiquity, and which is regarded as the best evidence for Egyptian contact with a so-called high culture by several authors. To understand the pyramids we need knowledge about the evolution of funerary practices and buildings, and the other pyramids in Egypt besides the "great three" at Giza, the "Gizamids". All of this is normally ignored in alternative history. Readers of such books are given the impression that there are only the pyramids at Giza and some piles of rubble. The concentration on only three buildings leads to a form of blindness – you can't see the forest for the trees. This blindness can be found in books by many authors proposing fantastic new geometrical relationships in and around "the pyramids" (normally reduced to "the one") and their positions on the globe. I once called it GPIS – "Great Pyramid Isolation Syndrome". A comparison between modern skyscrapers and medieval castles shows that we cannot deduce the complexity of a building by looking at its current condition, modern buildings will fall apart within a few decades without constant attention, whereas relatively simple buildings like Roman basilicas or medieval castles will survive for centuries. It's the same in Egypt: a relatively simple construction like the Great Pyramid, which is nothing more than large stacked blocks of stone, is still in good condition because even removing a large number of blocks can't destroy its structural integrity. In contrast, the Middle Kingdom pyramids were constructed a bit like our skyscrapers, with an inner, load-bearing skeleton filled with rubble or mud bricks and a limestone casing with a static function. After removal of the casing for lime burning or house building, the remains slumped to give the sad rubble piles visible today. There is also a claim that the Gizamids are the oldest pyramids in Egypt, thousands of years older than any other pyramid, and that the Egyptians later decided to copy them – and failed miserably. But if we look at the development of funerary architecture, how logical is this? Why did it take so long for the Egyptians to realize that the "originals" weren't step pyramids? The general idea of pyramids before the pharaohs is not uninteresting, especially when the renowned author Zecharia Sitchin has claimed to have evidence for that since the 1970s. For example, he sees the Great Pyramid and Sphinx in the Narmer palette, which dates from about 3000 BCE, or the Inventory Stela talking about restoration work on the sphinx done by Khufu. Is this serious evidence? Or are there better explanations? Sitchin is convinced that the only evidence that connects the Great Pyramid with Khufu is a fraud perpetrated by a hotelier in 1837. The name found in a newly discovered chamber contains, according to Sitchin, a writing mistake that was never noticed by Egyptologists. Can this be true? To explain why such a fraud is impossible, there's a short look at the writing systems of the Egyptians: hieroglyphs, hieratic and demotic. A problem for the "older pyramids" idea is scientific dating methods. But what methods are there, and how do they work? The most important methods are stratigraphy (analyzing the layers of soil during an excavation), dated ceramic types, and of course, radio carbon. These methods will not lead to a result like "died 3 April 3705 BCE at 3:44. ", but are the results really so inaccurate that we can toss them out as some "Chronology Critics" (an influential German group of Neo-Velikovskians, claiming that human history is only 2000 years old) claim? To show the problems and the possible range of errors we look at an example: a modern house is covered by a land slide and in 4000 years archaeologists try to date the catastrophe by analyzing the partly antique furniture. The pyramids are most probably as old as Egyptology says. But what ARE the pyramids? That pyramids are tombs is too dull for most people to accept, so authors of alternative history come up with a whole range of other uses; for example, landing beacons for approaching star ships, or a giant sun dial combined with an everlasting calendar. In the 19th century some scientists believed that the Great Pyramid was once open on one side and the Ascending Passage and Grand Gallery formed a gigantic astronomical observatory – a meridian instrument. Erich von Däniken even believes that the chambers in the Great Pyramid were cryonic chambers for deep freezing ancient star-gods. The ideas are discussed, with pictures demonstrating the problems. Instead of having technical functions, the medieval Arabs thought that the pyramids were treasure vaults from a lost antediluvian culture. This idea is still repeated by some modern authors, but is there evidence for this? Are the Arabic stories trustworthy? Most of the modern alternative authors see the pyramids only as a container to hold mathematical and geometric messages, also expressed through natural constants. The form and size were chosen so that the messages can survive millennia. These messages come from a distant past and tell us that the planners of the pyramids had a knowledge far superior to that of the ancient Egyptians. Several authors claim that the value of Pi, or Pythagoras' theorem is encoded, and not only in the buildings themselves. Some of these riddles can never be true as the data they are based on are false, as anyone can discover with a cheap pocket calculator. Regardless, these "riddles" are recycled throughout alternative literature, without once being checked. Another riddle is the position of the Great Pyramid. This combines so many coincidences that it could only have been planned by a people with exact knowledge of the earth. The pyramid stands in the exact centre of all land masses and divides the earth into exact portions of water and land – claims that can be checked easily. Things really got interesting when I checked some calculations to find numerological secrets in a profane structure – my bureau! I was astonished when I discovered that it also must have been planned by an early high culture, because I could find all the special constants there – and more precisely than in any pyramid! A miracle? Or just a sign that one can find anything everywhere if you have enough measurement points and mathematical formulae? The idea of the pyramids as a secret vault is not very convincing, so we should take a look at the arguments presented by alternative historians against the use of the pyramids as tombs. Why are there no inscriptions in them? Why were no mummies found? And why were no texts from Egypt found explaining the purpose of those buildings? Or does all this exist but it is suppressed by alternative authors? Herodotus, the Greek traveler who visited Egypt in about 470 BCE, wrote that the three large pyramids in Giza were the tombs of kings called Cheops, Chephren and Mycerinus. Most alternative authors dismiss this as lies, trusting the fantastic stories of Arabian historians or the "we don't know" claims of Diodorus. "Ancient source" is often seen as equivalent to eye witness, but is this true? Is Diodorus really an eye witness to events in ancient Egypt? No, in fact, Diodorus was separated from the time of the Great Pyramid by a longer time span than we are separated from him. To demonstrate this we use a hypothetical scenario. The Mongols conquer Europe in 2010 and 2000 years in the future a Europologist has to decide what source to use for his research – a travelogue, such as a book from Bill Bryson, who traveled the region in our times, or a philosophical text from a Mongol teacher 1000 years in the future who had his own ideas about the Eiffel Tower or Cologne Cathedral. But the greatest mystery is the pyramids themselves, their simple existence; this is the creed of all alternative historians. It was impossible for a simple civilization like the Egyptians to build such monuments with their simple tools and methods, or to plan and construct them – even preparation and transport of the blocks was an impossible feat. And even if they could do some of the tasks with their simple tools, they could never have done it in the time available. We take a look at all those "unsolvable" problems and start with the quarries. There is, for example, the assertion that a quarry as large as Egypt itself would have been necessary to quarry all the stones in the required time. However, if we take the numbers given by the author himself and check the results with a pocket calculator, we see that the quarries found at Giza are sufficient. There are more "impossible" tasks connected with the stone transport, several authors claim that all the blocks for the pyramids were transported with endless fleets of reed boats over distances of several hundred kilometers. Finally, we get an answer to the question why the Egyptians used such large blocks for their pyramids, rather than small handy ones. After clarifying the origin of the blocks we take a look at the problems preventing the Egyptians stacking them to make a pyramid. There is, for example, the assertion that the Egyptians of the Pyramid Age didn't have ropes, that wooden sleds would shatter under the weight of a pyramid block, or that it is simply impossible to build a ramp to transport the stone blocks. Then we examine the most probable ramp type: a spiral-integral ramp, after Klemm and Klemm, which rests entirely on the pyramid body and requires very little constructional material. In addition, the edges of the pyramid are completely visible, which is important to get a straight edge and only possible with an integral ramp. Next, we examine a model to transport the large granite monoliths for the relieving chambers without large ramps, and discuss the pros and cons of using concrete for pyramid building. Some authors propose some really bizarre solutions. Robert Charroux argues that the Egyptians knew herb extracts which could soften stone so that blocks could have been more easily quarried, while other authors propose a form of levitation. Can these theories really provide solutions and are those solutions better than those using traditional tools? The answers are astounding. The last riddle is a new one. It is the Orion Correlation Theory, published by Robert Bauval and Adrian Gilbert in 1994. This claims that the pyramids of the 4th and early 5th dynasty represent stars from the constellations Orion and Taurus. This topic is very complex and the book deals with only a small part of it, the so called "big picture". It examines how precisely the Egyptians could have mapped the stars and what accuracy was possible in copying this image onto the ground. Then a comparison between the stellar positions and the actual position of the pyramids is made using satellite images from Google Earth. The results are interesting and sobering. Comprehensive references and an extensive bibliography complete the book, whose conclusion is: Don't believe everything. The more dramatic the theory, the more skeptical one should be. And nothing beats checking the most outlandish claims yourself. I would like to thank John Wall and Joanne Conman for their help with the translation.